Kerk Lead Screw Assemblies are modified acme thread forms optimized for performance and available in a broad range of lead screw diameters, leads, and nut styles, custom designed for your application. Kerk lead screws are self-adjusting, maintenance-free and require no lubrication. Providing maximum accuracy, high repeatability, smooth, quiet operation and low cost, Kerk Lead Screw Assemblies are your best choice for high performance linear motion control. 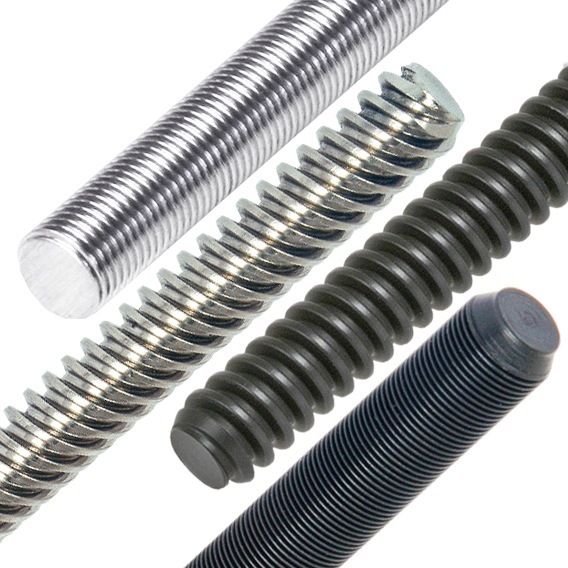 *Listed efficiency are theoretical values based on Kerkote® TFE coated lead screws. Shaded areas have been translated from their designed inch or mm dimension to an equivalent mm or inch dimension. Haydon Kerk Motion Solutions™ offers multiple options for lubrication. All Kerk® lead screw nuts feature self-lubricating polymers. When maximum performance is required, Kerkote® and Black Ice™ TFE coatings provide unmatched results in the most demanding applications. Kerkote TFE is a soft coating, a long-term dry lubricant that is optimized for softer plastics like acetals and nylons, with or without mechanical reinforcement. Lubrication to the nut / lead screw interface occurs by the nut picking up Kerkote TFE particles from the coating as well as from the migration of the internal lubricant within the plastic nut. The lubricant, although solid, also has some “spreading” ability as in fluid lubricants. Kerkote TFE coated screws provide the maximum level of self-lubrication and should not be additionally lubricated or used in environments where oils or other lubricant contamination is possible. Black Ice TFE coating shares many of the benefits of Kerkote TFE but, in contrast, is a hard coating that offers exceptional durability in all types of environments, with virtually any type of polymer lead screw nut. Rather than acting as a dry lubricant, Black Ice TFE is an anti-friction coating whose surface properties displace the metal to which it is applied. Though it is not intended for use with metal or glass fiber reinforced nuts, Black Ice TFE is bonded securely to the surface of the lead screw and can withstand abrasion from contamination, rigid polymer systems, fluid impingement and wash down applications. TFE coatings are intended to be used without additional lubricants. There are certain applications where external lubrication may be desired. These include the use of nut materials such as glass reinforced plastic or metal. Haydon Kerk Motion Solutions does offer a selection of greases developed specifically for these applications. Please contact a sales engineer for assistance selecting the best lubricant for your requirements. NOTE: Dashes must be included in Part Number (–) as shown above. Not all thread leads are available in all screw diameters. New nuts and leads are continually being added. Contact Haydon Kerk Motion Solutions for latest availability.